Islam presents a Most Compassionate and Ever Merciful Lord Almighty. The enduring practice of the raising of Divine Messengers among human communities testifies to the all-encompassing Mercy of Allah. Yet, when a Messenger presents himself before the community, they reject him. In the times of a Messenger, most people would revel in inequities under a veil of ignorance. The pride of riches, vanity of material favours, hubris of mundane power and social influence, arrogance of family inheritance- all seem to keep them away from God and His Messenger. Unfortunately for man, ingratitude and ungratefulness seem to be deeply embedded and ingrained as part of his DNA! 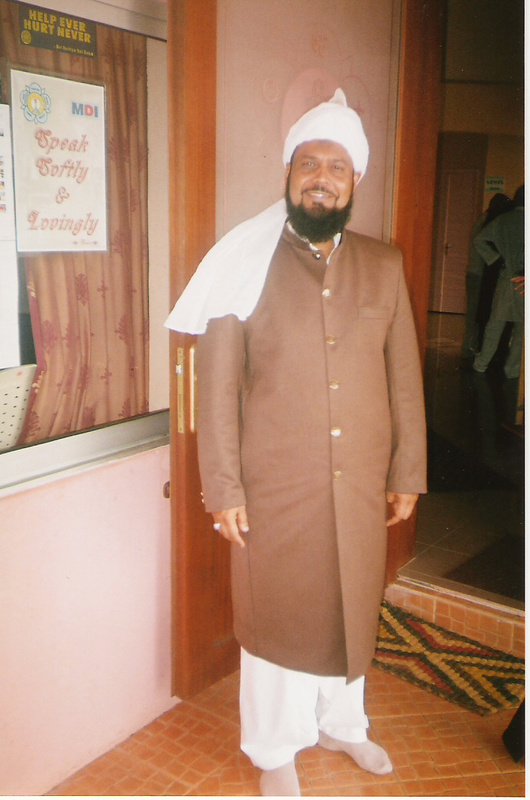 In his Friday Sermon of 26 April 2013, the Khalifatullah Hadhrat Munir Ahmad Azim Sahib (atba) of Mauritius gave a profound discourse on the Divine Law of raising of Messengers. Drawing upon the sacred traditions of the Holy Prophet of Islam (sa), the Khalifatullah (atba) points out that for Allah and His Messengers, it does not really matter how many will follow them, for the Messenger’s duty is to convey the Divine revelations and Message. History bears testimony that some prophets, rejected by their own people, found acceptance after their death and departure from this world. Some others may have had few disciples only. Yet, the situation did not and will not cast any shadow on their truthfulness or the veracity of their claims. The denial and rejection of Divine Messengers in the past notwithstanding, Allah the Almighty will continue with His enduring practice: of raising Messenger(s) who will call to Unity of God and the eternal well-being of Man through God-consciousness. Islam offers the glad tiding of heavenly bliss for the early believers in Divine Messengers, whose faith and practice will testify to their gratitude to Allah who raised the Divine Messenger, sincerity of heart and good deeds. Alhamdulillah, these blessings are available for believers in this age as well. Likewise, divine punishments await a generation that rejects the Divine revelations and Message. The contemporary situation of horrifying disasters and havocs visiting almost all the world should be fodder for serous reflection for all. For, these events are taking place at a time when the Messenger of Allah has been and is warning us against the evils of our times. The human condition seems to be riddled with the mystery of unconscionable suffering. For, disasters are striking the world and the people are being caught up in the maelstrom everywhere - in the land, on the air or even at the sea! Almost on a daily basis, innumerable events are taking place- earthquakes, devastating floods, hurricanes, horrifying forest fires, building collapses, accidents of colossal magnitude, terror bombings, deliberate (racial, ethnic or genocidal) killings on a horrendous scale, fresh outbreak of long-forgotten/contained epidemics, etc. How does one look at and begin to explain the occurrence of these incidents that inflict much pain and loss on the humanity of our times? Are they mere natural disasters or do they belong to the grave category of divine punishments when occurred after clear warnings and exhortations from the Divine Messenger of the times? 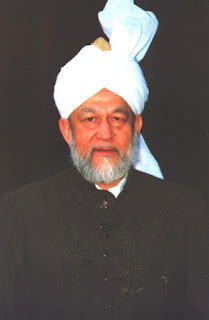 In his Friday Sermon of April 19, 2013 the Khalifatullah Hadhrat Munir Ahmad Azim Sahib (atba) of Mauritius discussed profoundly and provided illuminating insights on the subtle subject of ‘natural’ disasters in the times of a Divine Messenger. Allah raises His Messenger to guide the people to their Lord and to warn them against evil. The Divine Messenger is, then, given special knowledge about matter of the unseen and they make their prophecies accordingly. 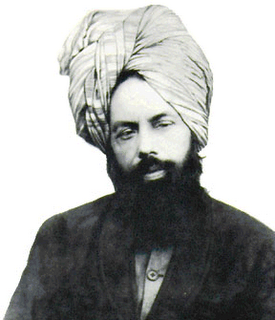 Some of the prophecies so made, shall find their fulfilment in the very lifetime of the Messenger. Some others may, however, remain unfulfilled in his lifetime. From the grand scheme of Divine Plan, the fulfilment of prophecies or their deferment to another time and space, make little difference. After all, everything depends upon Divine Will and Decree of Allah. And the Messengers have only the duty to convey the Message. This is the enduring Divine practice emerging from spiritual history. When a Divine Messenger arrives and delivers his spiritual message, it is for the people to consider and ponder over its import. It is for them to take positive and proactive-action to benefit from it. It is also for them to move away from proceeding in a direction being forewarned against in the message. Yet, history and the Holy Qur’an testify that most people are/will be heedless in the times of a Messenger, chained as they are/will be, in their family beliefs and religious traditions. They are familiar with and ‘comfortable’ at the old ritual practices in which they found their fathers indulging in. Indeed, they are glued to these rituals so completely that their beliefs are like ‘chains around their necks’ ‘reaching unto the chins’. It is the baggage of inherited notions, ideas and beliefs that comes us a barrier to the appreciation of pure belief/spiritual philosophy being articulated by the Divine Messenger. In short, their truth-perception ability itself comes under a veil. Consider our own times. Most Ahmadis are under wonderstruck that a Divine Messenger has been raised among them in the personhood of Hadhrat Khalifatullah Munir Ahmad Azim Sahib (atba) Mauritius. They are glued to their inherited notions and traditional practices so much so that they deify their elected Khalifa. They exalt him in defiance of Allah’s decree which has caused the coming of a Messenger in our times. Regardless their wishes, Allah in His Infinite Wisdom, has set in motion a chain of events, including the fulfilment of Divine Prophecies vouchsafed to the new Messenger of our times. 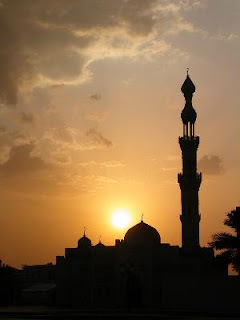 Alhamdulillah, like in the times of previous Messengers, there are many instances of fulfilment of Divine Prophecies in our times, as we have noted in recent weeks in the Sahih Al Islam Blog. The predictions and warnings issued by the Khalifatullah (atba) in recent months delivered a Divine message to the world, which may be summarized as follows: The synthetic happiness of material pleasures shall have a blinding impact on people. 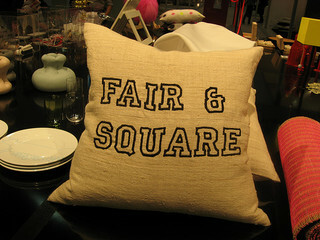 The greed for accumulation of property and resources will lead to the pursuit of unjust enrichment. Bribery and corruption, fraud and embezzlement- all would appear mere ‘ways’ to reach where one wants to go. Ethics and fairness, prudence and caution – all the ‘values’ shall reach the vanishing point from the mind-space of man, with consequences for his mental peace and physical happiness, only to find oneself among the lost at the end of the day! 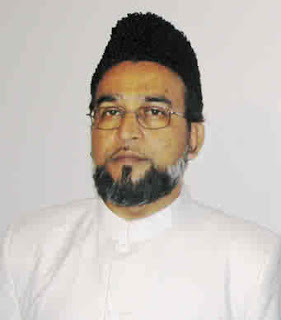 By the Grace of Allah the Most High, His Chosen Messenger Hadhrat Munir Ahmad Azim Sahib (atba) of Mauritius could comprehend the national events and understand the shady dealings waiting to unfold among his own people, especially on the great frauds and astounding corruption in society. Recent weeks have witnessed the unfolding of a spate of corruption cases in Mauritius. In the tangled web of fraud and deception, duplicity and embezzlement, are the ‘big’ people of society- politicians, corporate honchos and other influence-peddlers such as media-pundits. They have dirtied their hands with ‘shady’ deals and ‘black’ money, or embezzled public funds from the exchequer or defrauded the people by indulging in bribery or corruption. An account of the financial corruption scenario in Mauritius and the fulfilment of the predictions in this regard, emerge from the Friday Sermon of April 12, 2013 delivered by the Khalifatullah (atba). Divine Messengers are human beings, with the simple but profound and quiet but substantial difference that they are recipients of Divine revelations as against the ordinary folks like us. They work among the people day in and day out, calling them to an ethical and spiritual life that draws its sustenance from an abiding faith in the Unicity of Allah the Almighty. They bear witness to their times and their people by inviting to prudent conduct. They deliver glad tidings to those who follow guidance. And they caution the world against the egregious violations of ethical norms. 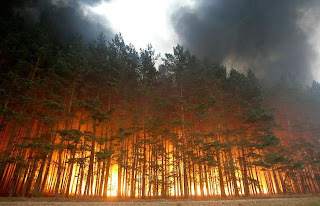 When their warnings are fulfilled and disaster strikes the land, they are pained at the suffering humanity, even as they recognize that the nature and the times are witnessing to their truthful prophecies and warnings. Such is the image of the Divine Messengers of the past emerging from their lived history as recorded by the Holy Qur'an. The Divine Messenger of our times Hadhrat Khalifatullah Munir Ahmad Azim Sahib (atba) of Mauritius has predicted and warned against great calamities waiting to unfold in Mauritius and elsewhere, in recent months. The DELUGE in Mauritius, the tragedy and loss of which shook the nation to its core last week and led to collective mourning, in its own way, testified to the majesty and might of the Lord who descended the Message on His Messenger. 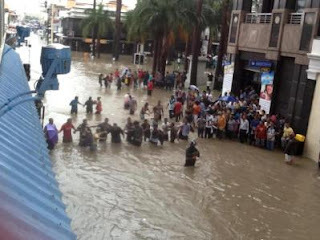 In the aftermath of the Great calamity of stunning proportions- "NABAA AL AZIM", to use a Qur'anic metaphor [78: 3]- in Mauritius, Hadhrat AZIM Sahib (atba) himself led the relief and social work undertaken by the members of Jamaat Ul Sahib Al Islam. Rejection of the Divine Message entails evil consequences for a people. When the Divine advices and instructions are being trampled upon and the Messenger is being ignored, it questions the majesty and wisdom of God Who causes the Message to be revealed to the Messenger in the first place. Such mindless and reckless rejection triggers a process of events that inexorably manifests Divine anger and wrath which affects individual destiny and alters national fortunes. All of spiritual philosophy and secular history bear witness to this. For instance, the Deluge in the times of Hadhrat Noah (as) continue to remain deeply imprinted in the spiritual psyche of Jews, Christians and Muslims. And the Holy Qur’an repeatedly confirms: “We never punish until We raise a Messenger”. 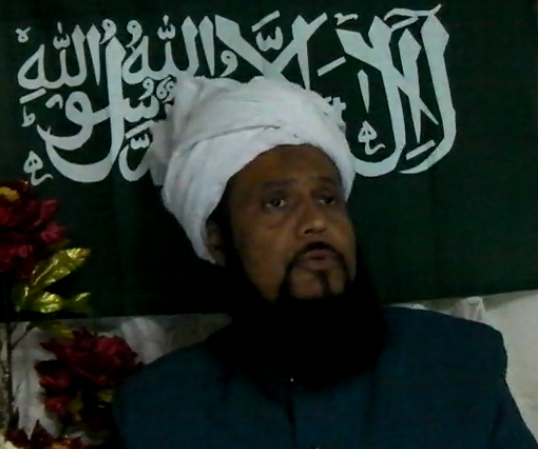 In his Friday Sermon of April 05, 2013 the Khalifatullah Hadhrat Munir Ahmad Azim Sahib (atba) of Mauritius reflected upon the recent Deluge in Mauritius, which he himself predicted in 2012 December. Drawing upon Qur’anic principles, Hadhrat Sahib throws searching spiritual light on the concept and special features of Divine punishment as against incidents of natural disasters that take place in the world. Hadhrat Sahib points out that in the case of Divine punishment; it is foretold before its actual occurrence by a Messenger of Allah. We hope and pray that this incident of extraordinary nature that has destroyed property, resources and precious human lives in Mauritius will lead to much soul-searching by men of intelligence and purity of heart, everywhere. 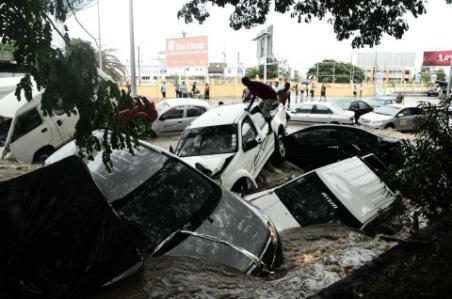 Mauritius has since last week (Saturday 30 March 2013) lived till date its worst days in the form of a unique kind of deluge which came and upturned the lives of many inhabitants, especially in Port-Louis, the Capital of Mauritius. Non-stop rainfall which the climate experts define as “deluge” as the rain water kept rising second by second, not diminishing in any case. ISLAM theorises that the clear knowledge of the unseen is only given to His chosen Messengers. The Holy Qur’an confirms: “He is the Knower of the unseen, and He does not grant anyone ascendency over His domain of the unseen, Except him whom He chooses as His Messenger. And in front of him and at the back of him march angels as sentinels.” [Surah Al-Jinn, 72: 27-28]. Thus, Allah the Almighty raises His Chosen Messenger in every era to warn the people about their excesses, shake their conscience about their irresponsible behaviours and greed and to take precaution against terrible events waiting to unfold as a consequence of what their hands have earned. 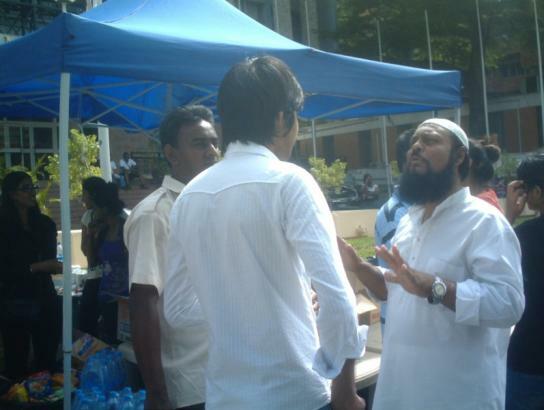 The Holy Qur’an testifies: “We never punish until We have sent a Messenger” [Surah Bani Isra’il, 17:16]. When the All Powerful, Almighty, Allah raises His Divine Messenger, heaven and the earth will bear witness to the truth of the Messenger. 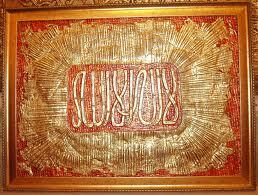 His veracity and truthfulness will be established through powerful signs. Consequentially, heavenly signs may appear, illuminating the whole sky in a flash, or the earth may tremble so powerfully as to turn everything over it upside down! In this age of climate change, people have neglected the ecological insights of the Holy Qur’an. The theology of ecology that Islam teaches has been completely ignored by the ‘Muslims’ themselves. The abuse and mistreatment of the environment is beginning to catch up with us, everywhere in the world. The effects of human greed, environmental degradation and irresponsible exploitation of natural resources overwhelm communities with death and devastation on a colossal scale.